Thankfully, we live in a world where the advancement of technology is the norm, and cartridge development is no different. It is safe to say that the 20th Century saw more iterations of the 30 calibre than any other calibre, and likely more than many other calibres combined. Following the birth of the 30 Winchester Smokeless in 1895 — the original designation of the 30-30 Winchester, which, for the purpose of this article will be allowed a six-year extension to be lumped into “20th Century Cartridges” — the 1906 introduction of the 30-06 Springfield solidified the 30 calibre in the hearts, and minds, of the North American hunter. The history of the 30 calibre magnums is not quite so varied as that of their non-magnum kin, though they have enjoyed an illustrious career. The fast .30 Mag’s of today are vastly different than the 300 H&H that ‘birthed’ them nearly a century ago. But the question still remains… Do we need another? There are certainly a number of people — “gun writers” included — that don’t believe we do. Among that group, there is a small but vocal population that bemoan the existence of the magnum entirely, regardless of what year it was created, which rifle it is chambered in, or how prolific its history has been. Typically this crowd is quick to cite the outliers of the hunting world. Bella Twin, a 63-year-old First Nations woman and experienced trapper from Northern Alberta who killed what was claimed to be the world record Grizzly in 1953 with a single shot 22LR. Or there’s W.D.M “Karamojo” Bell, a resilient Scotsman who, at the turn of the 20th century managed to take approximately 800 elephants with his Mausers 98’s chambered in .275 Rigby (7×57). Bell, a professional ivory hunter renowned for his incredible marksmanship, favoured the shootabilty and fast follow-up shots of the smaller calibres. There are countless other stories like this, but these two are some of the better known and verified. Regardless, they are used to uphold the belief that more power does not equal better, and that magnums are unnecessary, machismo-driven additions to the hunters stable of rifles. I’ve never quite understood that train of thought, even if the sentiment that shot placement matters above all else holds true. Perhaps my judgement on this matter is clouded by my predisposition for the featherweight 338 Win Mag I carry while guiding, but I see no shame in the use or development of magnum cartridges. That isn’t to say that I wholeheartedly support, or even care about, each and every new magnum that rears its head. Plenty of new cartridges over the years have seen their demise before they were ever able to see commercial success of any sort, often plagued by brass or ammo shortages. Many more have only achieved small, cult-like followings, successful enough to become a handloaders round, but never seeing the light of commercial mass production. Also worth noting is the fact that many of the common 30 cal magnums today are a solid choice for a variety of game at a variety of ranges. I love rifles far too much to subscribe to the belief that I should own a single rifle to do everything, though if I did, the 300 Win Mag would certainly make the short list. There isn’t much you can’t achieve with a 180gr Nosler Partition or Accubond moving along at nearly 3000 feet per second, and without feeling over or under gunned for that matter. For those of you that like the numbers, that combo should give you reliable expansion to nearly 700 yards with either bullet and enough energy to kill an elk out to 600 yards should you follow the common belief that it takes 1500ft/lbs of energy to do so. The 300 Win Mag is also commonly available and can be found at most sporting goods stores, and chambered by nearly every rifle manufacturer. They are also on the upper end of what most shooters can handle for recoil before it negatively impacts their shooting, without pushing over the limits. Surely I do not miss the mark to suggest that this 300 Win Mag load is the answer to our lust for a capable 30-cal magnum? Offering practical performance in spades, and with the sort of pedigree that will appease the Luddites in the crowd, there’s a reason it is one of the most popular mountain hunting cartridges to this day. But, as Hamlet once said, “Ay, there’s the rub!” For everything that the 300 Winchester Magnum offers us, practically speaking, the 300 H&H has already accomplished — thirty-eight years prior. I’m sure there are a few people out there who refuse to believe this, but a quick look at Nosler’s reloading data will confirm what I just stated. Nosler’s published data for the 300 Win Mag – 180gr partition shows a max load of 75.0 grains RL-22 at 3090 feet per second. Their data for the 300 H&H – 180gr partition shows a max load of 71.0 grains RL-22 at 3023 feet per second. Both of these velocities came out of 24” barrels, so it’s relatively apples to apples. I am fully aware that other powders can achieve faster results for the 300 Win Mag, and that 3023 was the fastest load published for the 300 H&H. I am also aware that finding suitable ammunition for the 300 H&H could prove to be a difficult task, but I’m not trying to justify the resurgence of the 300 H&H. I’m simply making an argument against those who are so resistant to new, to change, and sometimes, to experimental cartridges that fall flat on their face. If the tried and true of yesteryear was all that was really needed, you’d be shooting the old 300 H&H, or perhaps the 30-30 over everything. Thankfully this isn’t our reality and though sometimes the performance benefits are marginal, even negligible at common hunting ranges, we can move on from this idea that “new” doesn’t have a place in the world of cartridge development. Variety is the spice of life, nostalgia be damned. I believe that the greatest advantages of newer magnums, a category I don’t believe the 300 Win Mag falls under, is in the nuances of the ballistics. Ironically, the near-mythical status that W.D.M Bell’s .275 Rigby achieved was caused by the same driving factors behind Hornady’s development of the 6.5 PRC, and more recently the 300 PRC. What Bell realized over one-hundred years ago, was that long, sleek, heavy for calibre bullets of sound construction offered greater accuracy, penetration, and performance on game — specifically elephants. Cue current day trends favouring long range precision shooting, heavy for calibre, high ballistic coefficient, low drag bullets, travelling slightly over or around the 3000fps mark. While VLD bullets were long before their time, it would seem that our forebears were on to something with choices like the 7×57 or the 300 H&H. The nuances of today’s magnums like the 300 PRC may not change your life, they certainly won’t change mine. The majority of my shooting is done at 300 yards and under, as that reflects the majority of my hunting. 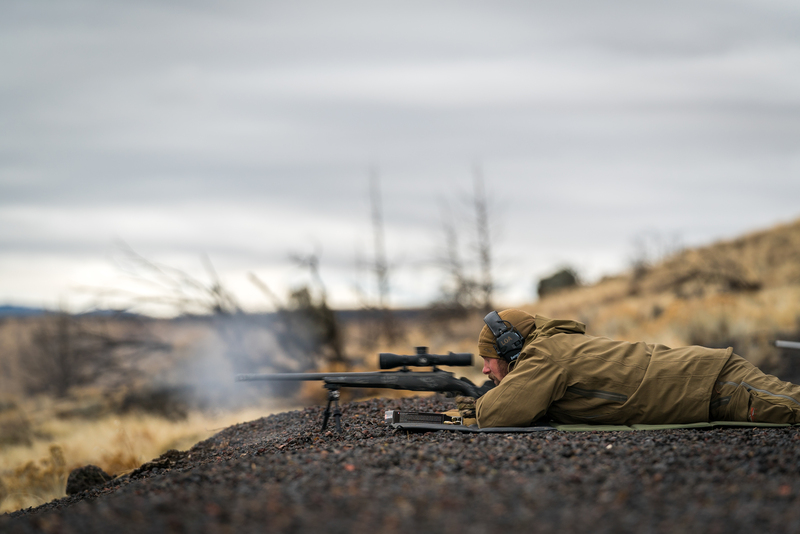 However, since rifle matches these days aren’t commonly won at hunting ranges, competitors and manufacturers seek to find the greatest performance at exceedingly great distances. As I brought to light in an article on the 6.5 PRC last year, the advantages of the 300 PRC aren’t seen until you stretch its legs out. Regardless of my own practical application of these nuances in ballistics, they certainly have my interest, and I believe I am not the only one. To be clear, this platform was designed for distances exceeding 1200 yards, but that doesn’t negate its application to hunters. A cursory search on match cartridges will tell you that many of commonly used hunting chamberings of today were either developed for, or first proven in competition. As much as we may feel otherwise, rarely are cartridges designed these days with hunters at the front of mind. Most of our shots are sub-300 yards, and of the ones that aren’t, many of them should be. I’ve seen it myself and spoke with other guides far more experienced than I on the matter, and the consensus is clear. When shots at mountain game exceed 400 yards, the percentage of hits falls below 25%. We simply aren’t pushing the capabilities of the platforms we use enough to warrant the kind of R&D that goes into cartridge development. For those of you that roll your eyes at the 6.5 or 300 PRC, that’s fine. There are plenty of old, tried and true options available, in a wide variety of rifles to boot. And at practical, ethical hunting ranges, nearly all of them will get the job done. For the rest of us, we can relish in the knowledge that we live in an age of tighter tolerances, standards, and ballistic nuances — where manufacturers seek to push performance and deliver high-quality products to the everyday user.